Capturing the Essense of Summer! Hello! Lori posting today from Gen’s Creative Team. It is summer time for those of us in the northern hemisphere, and for many that means lazy, hazy days. Those lazy, hazy days can be the perfect opportunity to create wonderful memories and document a life well lived! Capturing your life in photos lets you preserve all of the special little details that we love to remember when time has moved on. 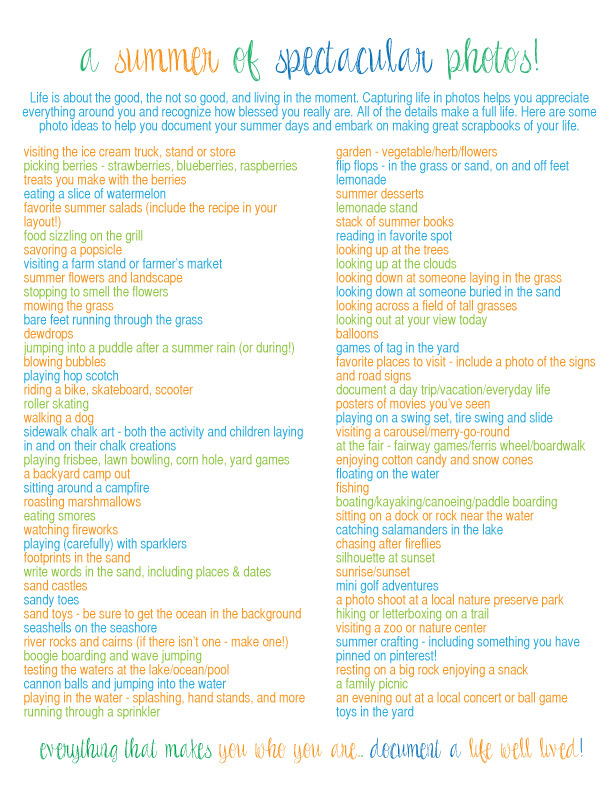 Here is a list of some of the great traditions of summer that you will want to photograph before the season is over (you can click on the image to make it larger). Get low – kneel, lie on your stomach, squat down to take a photo. Get eye level with your subject. Don’t worry about getting dirty or looking funny – you will love that you adjusted your perspective later when you look at your photos! Take photos of the details – get up close and personal with subject: the flowers, the food, the labels on the products. Macro shots and cropping in on the details allows you to highlight special aspects of your summer life in a fresh, new way. If you are going take photos in the middle of a bright, sunny day, move your subject into the shade so that you can avoid those harsh shadows. Be sure to go wide – take photos of the entire scene as well as the little details. One great way to do this is to zoom with your feet! You can move back and forward as you like to change your perspective. Don’t limit yourself to the range of the lens on your camera. Remember to take photos as life is happening. While photos of your friends and family smiling at the camera are wonderful, it is just as lovely to have photos of people living life and unaware of the camera. You will capture many sweet moments following this tip. Be sure to hand off the camera to someone so that you can be in some of the shots! You want to make sure you are documented as well. Even if you don’t like having your photo taken, your family will love it (and years from now you will likely love it as well!). Most importantly, enjoy the process and have fun – your photos will reflect that! Once you have your summer memories captured, you can then document those days with the great products from Gen’s shop at Pixels & Company! I will share a few of my favorite summer photos and how I scrapped them in an upcoming post so be sure to check back. In the meantime, go out and snap some great summer details! Happy Summer!